Familial Mediterranean fever (FMF) is characterized by recurrent fevers that last an average of 12 to 72 hours. With the fever, patients can have abdominal pain, swollen joints, especially in the ankle, and other symptoms. Pleurisy and pain when breathing are also common symptoms. 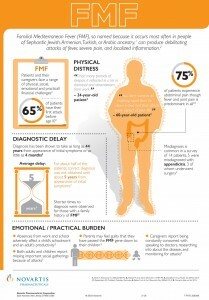 Most have their first symptoms before age 20. Research shows the most effective treatments for FMF are colchicine and biologics that target Il-1 (anakinra and canakinumab). In most cases, this disease is considered to be autosomal recessive inheritance, which means that one must inherit two mutated genes (one from each parent) to develop FMF. However, new research and findings have come about in recent years showing a number of cases of single-mutation FMF, acting more like an autosomal dominant disease. As with all autoinflammatory diseases, there are also cases of mutation-negative (meaning no mutations were found) clinically diagnosed FMF. 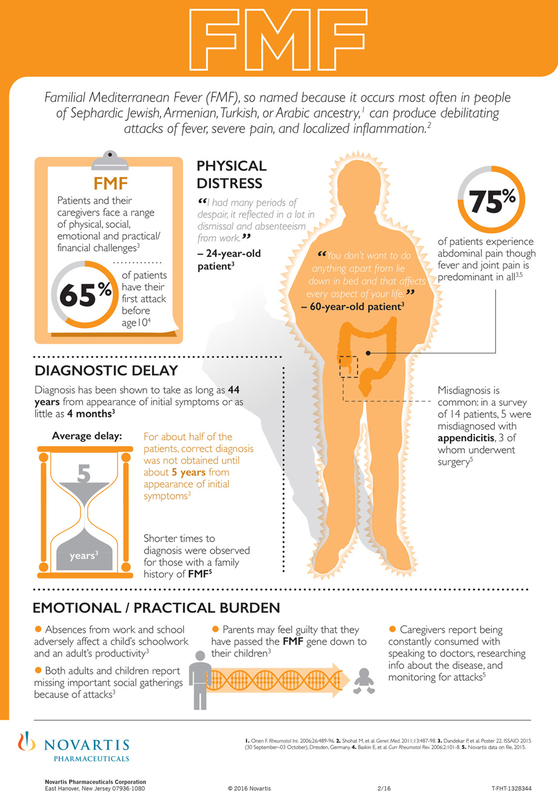 These patients have the symptoms of the disease, and respond to the FDA-approved medication, colchicine to treat FMF.